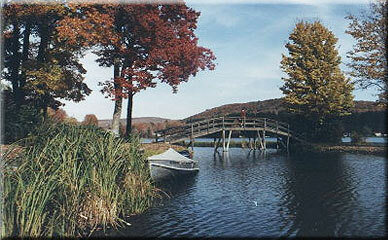 Page Lake is a private residential and vacation community in the Endless Mountain Region of Pennsylvania. Page Lake is owned and operated by the Lakeside Outing Club Inc., a non-profit organization composed of shareholders who live or vacation on the lake. Page Lake is a great place to live or vacation. There are plenty of local activities including fishing, water skiing, swimming, boating, canoeing, kayaking, golf, horseback riding, hiking, and several wonderful small local restaurants. The name of our corporation is the Lakeside Outing Club, Inc., with its principal office located in Lakeside, New Milford Township, Susquehanna County, Pennsylvania.  Provide, maintain and preserve Page Lake for the safe recreational activities of all of its shareholders.  Promote and maintain the natural beauty of the physical environment of Page Lake.  Prevent harm to the environment of Page Lake.  To enact and enforce rules and regulations for the use of Page Lake in a safe and reasonable manner and promote the general health, safety and welfare of its shareholders.  Coordinate the efforts of all shareholders within the club toward the common good. Page Lake is located 35 miles north of Scranton, PA and 30 miles south of Binghamton, NY. Take I-81 North or South to Exit 223 ( old exit 67 ) New Milford. At the exit take Route 492 East for 4 miles.